Doom Trooper is a collectible card game designed by Bryan Winter. It is based on concepts from the Mutant Chronicles franchise. Players use warriors to attack and gain either Promotion Points or Destiny Points. Promotion points can be used to win; Destiny Points are used to purchase more warriors and equipment. There are 13 different card types and over 1100 different cards available. Doom Trooper was originally published by now defunct Target Games. 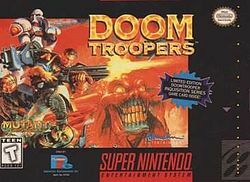 Doom Troopers (Also called Mutant Chronicles: Doom Troopers) is a video game released in 1995 by Adrenalin Entertainment for the Super NES and Mega Drive/Genesis gaming systems. It is a platform shooter similar to the Contra series. The player assumes the role of one of two commandos, Mitch Hunter and Max Steiner, fighting an evil horde of invading zombies and mutants. The game features eight different levels and the ability of two players to play cooperatively. It depicted blood and mutilations of the enemies killed. For example, the common enemies in the first level are usually decapitated before they die. At the time, this level of graphic violence was unusual for a Nintendo game.